Geoffrey McKinney and his products are not affiliated with Wizards of the Coast. 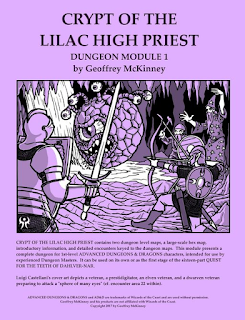 I know this because it says so right on the cover of this module, the latest in a series of several old school modules which do their darnedest to look like something TSR might have done in its heydays. This one is a mono-era knockoff with David Sutherland knockoff cover art, although it doesn’t quite go all the way with the trade dress fetishism – which becomes clear once you look inside and notice the homemade production values (unruly two-column text without even mono-era TSR’s concessions to modern deviltry like “layout”, “accessibility”, or “page numbers”). This is not always a good thing, but the module is as honest about its homespun simplicity as its sources of inspiration. What you get inside is a two-level dungeon which keeps the cover’s promise by presenting a no-nonsense, meat-and-potatoes dungeon adventure inspired by the likes of the Giants/Drow series. It is actually even more specific in its influences: it combines the “cavern rooms” inhabited by creepies and crawlies you find in G1 and D1, and the various weird evil temples you find through the series, and builds a full 35-room dungeon out of them for beginning characters. If you liked those rooms, you will probably find this module agreeable. The premise revolves around obtaining one of the teeth of Dahlver-Nar, here the prophet of the worm cult, an unpleasant society of purple worm-worshippers. Dahlver-Nar had enough magical teeth to fill a 16-module series (of which this is the first part), or it can be used as a one-off – it should work as well alone as in a series. The encounters put a high emphasis on monster lairs (a combination of cave dwellers and intruders who have come here following their agendas) with general oddities and magical enigmas, and the remains of a temple complex constructed within the cavern system, but apparently being reclaimed by it (there is a river running right through the cultists’ abandoned temple). The overall style has the sense of exotic oddness the author has been known for, without Carcosa’s gruesomeness or the generic blandness of Dungeon of the Unknown. This module has a fairly good balance of the different sensibilities it draws on – the familiarity of mediaeval knights and wizards in conical hats combined with odd-coloured otherworlds set in underground caverns. The worm cult’s traces in the dungeon complex are likewise a mixture of the mundane and the alien. There is even a beholder encounter (spoiler: it is right on the cover) which will surely encourage panicky guessing among seasoned players – is the GM using a gas spore or a real beholder, and can we afford to test it? – although I believe it does the wrong thing in the end. Sometimes, things feel randomly generated without being sufficiently thought through afterwards (a hard to find piece of treasure is talked up as a beautiful historical rarity, and then valued at 95 gp), and sometimes, this randomness feels justified as a weird underearth thing (a place where the characters can experiment with a cavern of varicoloured magical nodules, each producing a different magical effect). The dungeon’s layout is tricky at first glance due to all the twisting and turning corridors, but it is more linear than you would expect, and there is altogether less content than you could fit in here if the text was a bit more leanly written, and the maps had more stuff going on – minor things, but you notice them. Then there is that layout again, and I say this as someone who is usually satisfied with simple two-column text. Most encounters are presented as ungodly long blocks of text without breaks, bolded text or highlighting that would help sort out the information and draw the GM’s eyes to the important details. Important information is sometimes presented out of the logical order (e.g. room 10, where the probability of an important encounter occurring is given dead last), or thrown into the middle of a wall of text. Monster statistics are usually embedded into the flowing text… ironically, I swear there is an instance where they are omitted altogether, but I am not finding it. This is not good, and Tomb of the Sea Kings, another module wearing its love for mono-era TSR on its sleeve shows that it can be done while keeping that iconic look. However, the maps are fine, legible and mostly unambiguous: they do their job and don’t get in the way. 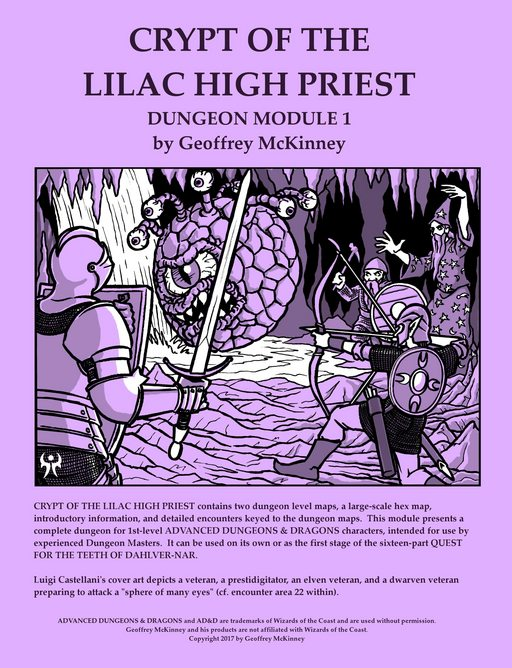 Crypt of the Lilac High Priest, as stated before, is a fundamentally honest take on mono era AD&D with a light weird touch. It is not a real standout, but “better than average” describes it suitably. When OSRIC opened the gates before small-press old school adventures, this is about what I was expecting (and sadly, wasn’t getting) as the standard. If the forthcoming parts of the series solve the layout and presentation issues, they will be a solid addition to a GM’s module library. No playtesters were listed for this adventure. Geoffrey McKinney and his products are not affiliated with Wizards of the Coast. Wizards of the Coast and their products are not affiliated with Geoffrey McKinney. Title sounds interesting, but the link is not working, so fix it or post comment here. Neither link works for me, but I am sure you will work it out. Really you should be able to make your point here. Right. I am 'mocked' there because I am the only one in the osr who is willing to challenge them there. There are only about 6 shitheads at ydis anyway which makes it remarkable that even on a site where anonymity is rife people are afraid to post there. All I asked you to do here is make your comment readable which you seem incapable of doing. Prolix, with very slight content and that easily invalidated by pointing out that there were a thousand times more people playing AD&D in the early days, so your durations are irrelevant measures.